For 25 years, the Foundation has helped Mexico make important advances in the quality of its educational system, the modernity of its workforce, and its highly added value as a manufacturing partner. This impact has reflected the Foundation’s funding base, as its core staff and operations are at this time primarily supported by Mexico’s government, nonprofits and business consortia. These investments have helped the Foundation support an imperative step to highly beneficial cross-national economic activity: building up capabilities on the Mexican side. Joint national partnerships based on the highest levels of talent and economic performance are now within reach. Meanwhile, dramatic changes in the world have only heightened the exciting economic prospects for this region. Global trade has risen exponentially, binational connections have strengthened across numerous industries, and highly sophisticated communications technologies have emerged to greatly simplify partnerships and knowledge-management at a distance. Working in partnership, the United States Congress and the government of Mexico long ago envisioned the extraordinary potential of the border region that is now within reach. Their confidence in these possibilities captured the imagination of a committed network of public and private stakeholders that have made the United States-Mexico Foundation for Science (USMFS) a vital force in knowledge-based binational collaboration for secure, lasting economic and social benefit. In the quarter century since its emergence from this powerful collaboration, the Foundation—which in Mexico is known as FUMEC (for the acronym of its name in Spanish)—has been growing and building its impact. 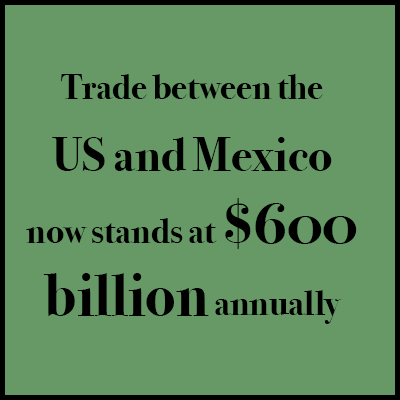 Trade between the United States and Mexico has grown six fold since the 1990s and in 2015 stood at $584 billion annually. One of every 29 U.S. workers has a job supported by U.S.-Mexico trade. Trade now flows both ways, particularly when final products are manufactured in several cross-border stages. In 2014, Mexican industries consumed $136 billion dollars in partly finished U.S. goods, while U.S. industries consumed $132 billion dollars’ worth of partly finished Mexican goods—a four-fold increase since 1995. Annual Mexican investments in the United States have quadrupled since 2005 to $17 billion. The U.S. is Mexico’s principal foreign-investment destination, and more than 120,000 U.S. jobs are supported by direct Mexican investments. As such facts show, the U.S. has already benefitted from increased economic engagement with Mexico. This reality runs counter to what many perceive otherwise, but the data tell another story. And the advances of recent years pale in comparison to the opportunities ahead. Knowledge-based collaborations—around science, engineering and education—present an opportunity to boost jobs, wages and economies of scale, transforming the border region into one of the most significant in the global economy. Fostering new knowledge-based businesses of lasting economic significance for both countries. Establishing public-private partnerships that invest in human capital and seed impactful new educational and economic developments. Identifying new research opportunities, educational programs, business ideas and capital investments that only collaboration can bring to fruition. Strengthening essential cross-border initiatives to improve public health north and south of the border while mitigating environmental risks. Through partnerships that make the most of this region’s prospects for growth, this vast North-American alliance can improve the lives of millions of people.